We started the Napa Valley Wine Tasting Index Fee in 2014. Back in 2014, the average tasting fee on our Index was $18.50. Today it is $30.50. We are using ten wineries along Highway 29. These wineries allow drop-in visitors to the tasting room. We are using the cost of a basic tasting for this index. In the late 1960s, when Janelle and I first began to visit the Napa Valley, no wineries that we visited charged a tasting fee. Ah, the good old days of the Napa Valley! This year we were quite surprised to find the smallest increase on a year-to- year basis since we started tracking tasting fees. $30.50 vs $29 from a year ago. Perhaps the wineries are in the mindset that the fees for the entry level tasting fee has reached a saturation point. Most of the Napa Valley wineries have discovered it is much more profitable to have elaborate wine tastings, accompanied by foods to the match the wines. Indeed, one restaurateur who recently closed his restaurant citied wineries offering food for the decline in his restaurant’s patronage. Elaborate tastings combining foods, tours, and barrel tasting can easily be over the $100 range. These require reservations. Tasting fees will change periodically throughout the year. Always check the winery’s website for the latest information on tastings and fees. December and January are certainly the quietest times in the Napa Valley. Fewer tourists come at this period of the year, so everything is much less crowded. Yes, we do have rainy days in these two months, but more than likely there will many sunny and crisp days to enjoy the greatest wine region in the world. Here are five fun things to do in Winter in the Napa Valley. We are on the docket to attend this wonderful local annual event. The Pauper’s Feast is held every December in the restaurant at the Calistoga Inn. The date is Thursday, December 20. There is a set menu at a very reasonable price and a local group that sings Holiday cheer. Reservations are recommended at the Calistoga Inn Restaurant. If you cannot make the Pauper’s Feast, you can substitute a walk up and down the streets of Calistoga. Calistoga is much more laid back than the rest of the Napa Valley. There are plenty of tasting rooms, boutique shops, quaint restaurants, and even a museum. Calistoga rocks! The main portion of the Oxbow Public Market is inside, so when it is raining it’s the perfect place to visit while in Napa. The Oxbow Public Market is a bevy of activity each day. There are artisan vendors selling spices, tea, grass-feed beef, organic produce, plus much more. There are several gourmet fast food services, and two that we can highly recommend are C Casa and Ca’Momi. The Oxbow is an excellent spot to relax and sit while sipping coffee or wine and do some serious people watching. 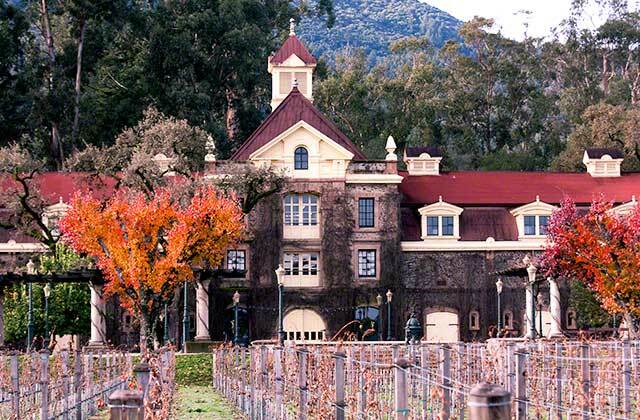 Inglenook is the winery that film director Francis Ford Coppola brought back to its former glory. It is a stunning Chateau, as you can see from the photo at the top. The tour is one of the best, as well it should be at the price of $50 per person. The tour gives a fabulous look back at the wine history of the Napa Valley. The Chateau also has a bistro where you can sip wine or expresso and order a cheese plate and just do some serious relaxing. Explore the wine merchandise shop and the memorabilia around the different rooms of the Chateau. Enjoy the scenery of the surrounding vineyards. See Inglenook Experience. Over on the Silverado Trail, you will find Mumm Napa, producing excellent sparkling wines. One of the little-known aspects of Mumm Napa is their fantastic art gallery. There are two sections to the art gallery. One has a permanent photo exhibit of selected works of the great Ansel Adams. The other gallery hosts rotating exhibits. Currently, photographs by Todd Hido are on display. Tours and tastings are available for a fee, but the art gallery is open to the public. Check the Mumm Napa Website for complete visiting details. What is the difference between the Napa Valley and Sonoma? To the Napa Valley or Sonoma? Should I travel to the Napa Valley or should I go to Sonoma? What is the difference between the two wine regions and which one is better? St. Francis Winery in Sonoma. In the background are the Mayacamus Mountains. Janelle and I have been traveling to both the Napa Valley and Sonoma for many years. We are expert travelers to both wine regions. Let’s go over the significant differences between the two. The Napa Valley runs north and south for 30 miles. To the south is the city of Napa, and at the northern end is the town of Calistoga. At its widest point, the Napa Valley is five miles. Sonoma wine region is much larger. Sonoma has three separate wine areas. First, there is Sonoma Valley near the town of Sonoma. Near Healdsburg, there are the Dry Creek Valley and the Alexander Valley. The Russian River Valley runs through the towns of Graton and Sebastopol. There are even wineries on the edge of the Pacific Ocean in Sonoma. The Napa Valley has four tourist destination towns. These are Napa, Yountville, St. Helena, and Calistoga. Sonoma’s most popular destination towns are Sonoma and Healdsburg. Napa Valley wineries make many varieties of wine. Chardonnay and Cabernet Sauvignon have the greatest vineyard acreage and production. Sonoma has more varieties of wine. These wines include Chardonnay, Sauvignon Blanc, Cabernet, Pinot Noir, Syrah, Zinfandel, and others. The large geographic area of Sonoma lends itself to growing many types of grapes. The Napa Valley wineries are close to one another and are easy to find and visit. Drive along Highway 29 or the Silverado Trail, and there are many wineries to visit. Most are open without an appointment. Sonoma wineries are more spread out. There are many beautiful backroads in Sonoma. There is much more traffic and congestion in the Napa Valley. Sonoma is larger, so there are more roads to travel to wineries. Napa Valley tasting rooms can be very crowded with tourists. The same can be said for the popular Sonoma wineries. Napa Valley wins the restaurant comparison. Napa Valley has many upscale restaurants. It has two top Michelin Star rated restaurants. They are the French Laundry and the Restaurant at Meadowood. The towns of Healdsburg and Sonoma have excellent choices of restaurants. The cost of dining is higher in the Napa Valley. Both the Napa Valley and Sonoma have many great choices for lodging. Budget to luxurious accommodations can be found in both regions. Napa Valley can be uppity at times. Sonoma is more laid back. Sonoma has more small and family-owned wineries than the Napa Valley. The Napa Valley is one of the great wine regions of the World. A weekend stay in the Napa Valley will be more expensive than a weekend stay in Sonoma. Do you like to picnic in the vineyards? Sonoma has many more winery picnic areas than does the Napa Valley. Napa County has restrictions on picnicking. Both the Napa Valley and Sonoma are sensational wine countries and are both worth a visit. We highly recommend visiting both, but on separate getaways. Calistoga is our favorite town, and we loved coming to Brannan’s to sit at the 1880’s Brunswick mahogany bar. I don’t know the name of the Brannan’s bartender, but he was a friendly and efficient server. We popped into the Brannan’s bar just a few times a year. Each time the bartender remembered Janelle’s favorite cocktail, the Branhattan, the best Manhattan in the Napa Valley. We hope that the restaurant reopens under new owners and that they have the common sense to keep the beautiful mahogany bar. We will miss Brannan’s Grill. All the locals know about Cindy’s Backstreet Kitchen, it is the spot to talk about wine, vineyards, and everyday Napa Valley life. Tourists love the eclectic menu and the enjoyable atmosphere of Cindy’s Backstreet Kitchen. Sadly, Cindy Palwcyn is closing her beloved restaurant on Saturday, July 7, 2018. The word is that Cindy Pawlcyn was offered a proposal she could not refuse and has sold her restaurant to an unnamed buyer. We have been to Cindy’s on several occasions. The small plates are fantastic and fun to share with your friends and family. The wine list is extensive and the wines priced well below most restaurants. Cindy will continue to operate her first Napa Valley Restaurant, Mustard’s Grill in Yountville. Most of the staff at Cindy’s Backstreet will head over to Mustard’s. We will certainly miss this terrific St. Helena restaurant. Read more about the closing of Cindy’s Backstreet Kitchen. The Margrit Mondavi Summer Concert Series is one of the great summer traditions in the Napa Valley. Check your travel calendar and purchase your tickets as soon as you can. The Margrit Mondavi Summer Concert Series takes place on five consecutive Saturday evenings beginning June 30 through July 28. Tickets are on sale as of April 10. Each month the CIA at Copia in Napa will host weekend-long Conversations on timing topics of that impact our lives. The next event will be on April 7-8, Sustainable Seafood and Bay Area Watersheds. We as individuals can contribute to sustaining the wondrous world of water and marine activities. For more information on this event, please see Conversations. What will it cost to taste wine in the Napa Valley in 2018? This is the fifth year in succession that we have tracked Napa Valley tasting room fees. This is an unscientific study with a small sample of wineries. The intent is to give wine country travelers an idea of what it costs to taste wine in the Napa Valley. A trip to the Napa Valley is expensive these days. With the economy booming, Napa Valley is a fashionable getaway and a paradise for folks with plenty of splurge money. For the Napa Valley Tasting Room Index, we have chosen the same set of wineries as last year. These are wineries on Highway 29 that are accessible and popular with tourists. The cost of the tasting is for the bottom-tier level of tasting. Many wineries have several levels of tastings of all types. Be aware that most wineries require an appointment for the top tier and exclusive wine tasting experiences. Tasting room fees can change from one month to the next. These prices are as of March 2018. These wine tasting fees represent the entry-level wine tasting. The Napa Valley Tasting Room Index for 2018 is an average of $29. This compares to the 2017 rate of $27.50. * No increase over the previous year’s tasting room fee. Do You Know Napa Valley’s Big Three? Welcome to the world-famous Napa Valley. If you travel to the Napa Valley or consume Napa Valley wines, here is what you should know about Napa Valley’s “Big Three.” We attended a wine tasting of the “Big Three” at the Castello di Amorosa winery in their beautiful Great Hall. We tasted three Chardonnay wines, two Merlots, and four Cabernet Sauvignon wines. The occasion was part of the Wine Bloggers Conference held in November in Santa Rosa. Let us begin with Chardonnay. Do you have your glass of Chardonnay in hand? Chardonnay accounts for 6,397 acres of vineyards in the Napa Valley. Chardonnay represents 15% of the vineyard acres in the Napa Valley. The average price per ton of Chardonnay grapes is $2,952. Among the “Big Three,” Chardonnay offers the winemaker the most flexibility in creating a wide range of flavor profiles. It can be produced in stainless steel, neutral oak barrels, and French or American oak. There are also different winemaking treatments, such as battonage and malolactic fermentation. The result is Chardonnay wine that can range in character from light and fruity to robust, with creamy butter and big oak flavors. Chardonnay tends to love cool climates and the Carneros region fits that environment. Hillside regions also offer cool climates, and many flavorful Chardonnays come from the hillside vineyards on Spring Mountain. One interesting idea is to try Chardonnay at the two extremes. Hendry Winery in the Napa Valley makes an unoaked Chardonnay. It is fermented and aged in stainless steel and not allowed to go through malolactic fermentation. Compare it to the Rombauer Carneros Chardonnay. This wine undergoes malolactic fermentation in barrel and spends nine months aging in American and French oak. The two wines show the versatility of Napa Valley Chardonnay. Merlot became one of the best-selling wines in the early 2000’s. It was a favorite wine among party goers and wines by the glass at bars and restaurants. Merlot’s popularity changed in a heartbeat in 2004. The cult movie Sideways arrived in the theaters. The main character in Sideways, Miles, cast Merlot as a trendy wine not worth tasting. Sales plummeted. Merlot is on the rise again. Just this past month, the Wine Spectator named a Napa Valley Merlot as the number one wine on their list of Top 100 Wines of 2017. It is the 2014 Duckhorn Three Palms Vineyard. That wine sold out shortly after the Wine Spectator’s announcement of the number one wine. Today there are 4,707 acres of Merlot planted in the Napa Valley, fetching an average price of $3000 per ton. Merlot is a grape that grows well in many climates but it particularly likes climates with cooler temperatures like Carneros, Oak Knoll and mountain hillsides. In contrast to Cabernet Sauvignon, Merlot tends to be a softer and not as intense wine. Both are Bordeaux wines, Merlot being the grape of choice in the Right Bank of Bordeaux. Cabernet Sauvignon is the King of all grapes grown in the Napa Valley. Many Napa Valley vineyards have been ripped out and replanted with Cabernet Sauvignon. Vineyard acres of Cabernet amount to 20,342 (45% of the vineyard acreage) in the Napa Valley. The average price per ton is $6,289. This represents 64% of the total value of grapes in the Napa Valley. There are several “Cult Cabernet” producers of Cabernet Sauvignon. The price for these wines can be astronomical. Screaming Eagle, Harlan, and Bryant Family Vineyard are examples of highly sought-after Cabs selling at high prices. These wineries have a waiting list to get on the buying list. But there are affordable Cabs in the Napa Valley, and excellent Cabernets can be purchased for under $20. Black Stallion and Robert Mondavi Napa Valley Cabernet are two examples. Next time you head for your Napa Valley wine country getaway you will be armed with this knowledge and information about the “Big Three.” Enjoy and discover these famous wines of the Napa Valley. Try these links for helpful information. The Wine Country Fires took their toll on thousands of homeowners and other industries. There are 42 reported deaths from the fires. Several wineries suffered significant damage, but the majority are up and running. The entire community of Napa Valley needs your support. Without tourism, the economic losses will increase even as the fires become contained. Head to the Napa Valley and enjoy the chance to help support wine country and all its workers.